well, yeah, didn’t you see the mug? I like how the zombie assistant’s expression is just like “Man this is an awkward conversation”. Oh, yes, Robert turned out VERY well adjusted xD Just ignore the bit about him killing himself. Opa, you..
Actually he was murdered, Schiten only thought he committed suicide. Hmm…. I don’t remember that being explicitly stated or even implied anywhere. I thought that was because Schtein tried to kill her. It was implied at the time of that flash back that Schtein’s mother drove the father to suicide. She didn’t deny it. that James knows that Robert’s death was not suicide. I bet a kid or a group of kids with telekinetic powers could make or help make a very convincing-looking suicide scene. It’s just struck me now how much Grandpa Orville bares a passing resemblance to Hunter Thompson. He even has the sunglasses. I’m really glad you pointed this out. What a cute Grinch like smile Opa gives. Adorable. Is that a wedding band on Orville’s hand? Nice! Actually, he reminds me a lot of my Grampa. Of course, my Grampa is a social justice activist, but he’s also an eccentric physicist, and those expressions are JUST like what his would be if he was talking about work. 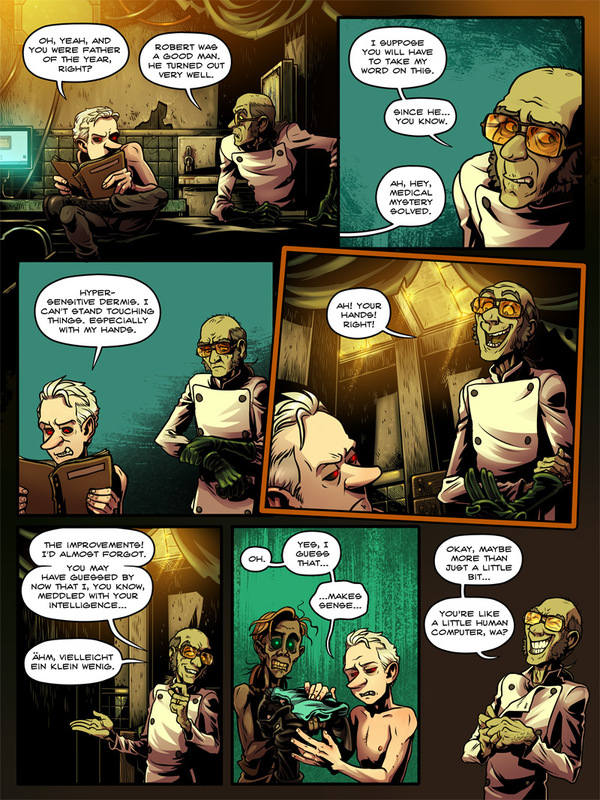 Opa is such a cute mad scientist. Opa Schtein = what I imagine Medic might look like when he’s 103 years old. I’m diggin’ the Opa. I think they need to make a screwball buddy film together while dominating the world. Somehow I don’t think it’ll work out quite that way, though. Is that the Fan-Girl Zombie? Yeah I’m just gonna keep drawing her forever. I like how Opa shows sadness at remembering his son. It looks like he really was proud of him and how he turned out, even if he seems to think he didn’t do a very good job at raising him. I like him. He’s a lot more believable than other… “bad guys”. Don’t feel like all your smarts are to belong to Opa, Doc. You could have just as easily ‘wasted’ all that improved intelligence by being coming a back ally junky or something similar. Unless he found away to genetically compel you to become a scientist, you are what you are because you chose to be. Opa just gave you the ability to choose. ^This. You have a very good point! No, actually, it is 100% correct. The indefinite pronoun combinations “ein wenig” and “ein bisschen” are interchangable. As a native speaker, I agree with Christina: Both expressions are totally valid in that sentence and get used exactly like that! oh, phew. Boy, language sure can be tricky. Even in your own native language sometimes! Like, I’m often grammatically wrong with English. Or I’ll use words that aren’t real just because they’re more common in spoken language (although I’d argue that makes them real) like for instance snuck vs sneaked. Snuck isn’t correct, but sneaked sounds idiotic to me. Language! Anyway, I’m rambling, I just find this all so interesting. Only after reading this a few times did I notice that Opa is in the process of removing his clothing. Here’s hoping he’s just taking off his jacket and gloves. That is exactly what he’s doing. It’s like 80 degrees in there, you know. I really wish you would put translations of the german at the bottom of the page or something. It really makes it difficult to read. I always feel like I am missing something when I don’t understand what is being said. Nah, it’s never that important. With all due respect, Tessie – if you’re reading this on the intahtubes like the rest of us, and context isn’t enough, you can always use http://translate.google.com (I actually have that as one of my search engine choices, so when I come across foreign language content that looks interesting, I just paste the phrase (or the actual url if the text is sourced, and not an image like with this comic) in the search slip and let google do the heavy lifting. I saw a guy that looked EXACTLY like Schtein, no joke. The resemblance was uncanny. I wanted to go up to him and ask to take a picture, but that would have been weird huh? I take that the Gregory Jessup mentioned a few pages ago is the guy under the question mark? (commenter calls her “Ronnie”?) is the kid in the middle of the group photo? The Ronnie thing was a joke because on a previous page I’d snuck a character from another webcomic in there, haha.